Green chili is a staple of Indian and South American diets. The chili is the fruit of the flowering plants Capsicum annuum and C. frutescens. Green chili is mainly used as a spice in food, although it is included in some medicines. It yields an oil that is viscous, sharp and pungent, and can also serve as a seasoning. The chili can also be ground into a powder to use for similar purposes. The most abundant nutrient in green chili is vitamin A, according to the U.S. Department of Agriculture's National Nutrient Database. The vitamin is a carotenoid, also known as retinol, associated with the antioxidant beta-carotene. Vitamin A is essential for the health and maintenance of bones, teeth, mucous membranes, eyes and skin, according to Medline Plus. The vitamin is essential for healthy eyes, as it produces retina pigmentation and promotes night vision. Vitamin A deficiencies result in weakened vision and immunity. 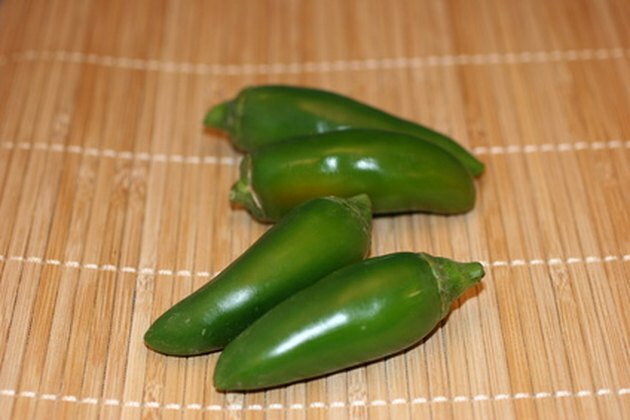 Vitamin C, or ascorbic acid, is the second most abundant nutrient in green chili. It acts as both an antioxidant and a vitamin, says Medline Plus. It is essential for the formation of collagen, scar tissue, ligaments, blood vessels and tendons. It also helps the body to maintain and repair wounds, bones, teeth and cartilage. As an antioxidant, it strengthens overall health and helps the body fight infections. Green chili has a large amount of dietary fiber -- 2 teaspoons of dried chili powder contains 10 percent of the Daily Value for fiber recommended by the Food and Drug Administration. Dietary fiber is indigestible and passes through the digestive system, pushing out waste. It also contributes greatly to satiety. Fiber can prevent constipation and help maintain a healthy weight as well as promote digestive health, particularly in the intestines. Capsaicin is a substance that occurs naturally in chili peppers, giving them their spicy flavor. The hotter the chili, the more capsaicin it contains. Capsaicin effectively inhibits neuropeptides that cause inflammation, thereby reducing inflammation when ingested. There is clinical evidence that capsaicin can also treat nerve-related disorders like persistent pain, psoriasis and neuropathy. Moreover, capsaicin acts as a natural pain reliever that is potent enough to help treat conditions like osteoarthritis.